(Newser) – Earl Thomas' career as a Seattle Seahawk is probably over—and it did not have a happy ending. 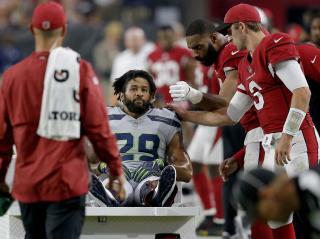 The star free safety gave the finger to the Seahawks sideline during Sunday's game against the Arizona Cardinals as he was wheeled off the field in the fourth quarter with a lower leg fracture, USA Today reports. Thomas, who was drafted by the Seahawks in 2010 and helped them to Super Bowl glory in 2014, is in the final year of a four-year, $40 million contract and has been feuding with the team for months, demanding that they grant him either a trade or an extension. The 29-year-old sat out training camp and missed three practice sessions in recent weeks. Don't miss this game a bit. He is definitely a gagger.